As I mentioned in an earlier post, Austin got quite a bit of rain this week. So Seth and I were not too optimistic that the area trails would have recovered in time for us to get in a ride this weekend. This morning, I started calling around to all the parks asking if the trails were open and so on. Many weren't. Finally, I called Mule Shoe Bend but couldn't get a trail report. 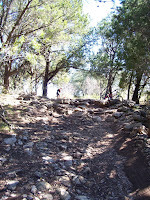 After consulting a local organization's site, we found that MSB actually dries out faster than alot of the other trails and most likely would be open after 2 dry days. 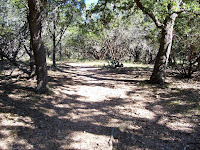 We packed a lunch, loaded the wagon and headed to the trail. We also brought our trail runners just in case they were closed. Hiking is better than staying home and doing laundry! Turns out, MSB is quite a hike. It took us almost an hour to get there and we got a little lost. We got there though and upon arriving, the park ranger told us the trails were open, handed us our permit, and told us to have a great ride. We hit the goldmine! So we set off and had a great time on the trail. 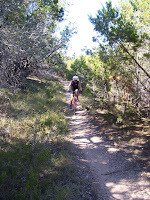 It's a super fast 7.5 mile loop with lots of twisty singletrack, tight turns, drops, and some moderate climbing. 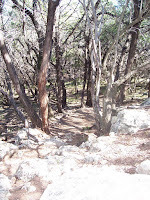 There were a couple of rocky steep climbs that had huge boulders (see pics) that I had a difficult time manuevering but that's okay, cuz I rocked the drops and descents. 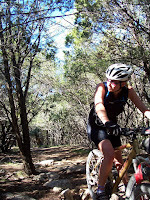 This is a sweet trail for hardtails! I had a killer ride and was really feeling it. Maybe Gaines Ranch has been good for me after all. ;-) We also spotted a couple of deer grazing - I heard the clatter of their antlers and thought at first it was rider behind me. I was pleasantly surprised to see the deer bounding through the woods as I rode by. Although this trail didn't have the "views" that Barton Creek has, it is by far my favorite thus far. We will be returning with friends to enjoy this one.